Buy Hula Hoop That is Right for You! Thinking about purchasing your own hula hoop? That's great... Hula hoops are a crowd-pleaser, especially for summer barbecues and party entertainment. But before you go out and buy one, there are several things you need to know to help you select the right hoop that is right for you. What Are The Hoop Types? Sport hoops usually have a larger diameter and are recommended for most hoopers who are interested in a workout to loose weight. They are designed for fitness. The added weightmakes it easier to control and keep it twirling around your waist. Sport hoops are ideal for toning your core/abs. This is the type of hoop I started out with to tone up my core and abs. I saw results after about a week of use. Keep in mind if you are just starting out with a weighted hoop you may see some bruising the first few days. I would only use the hoop for a few minutes a day during the first week until my body got use to the weight and my core was stronger. Dance hoops are designed for performance by experience hoopers. They are much smaller and lighter than the sport hoops. These hoops are very festive and colorful with elaborate tape applications. They are great for upper body and off body tricks. Because dance hoops are smaller they can beenjoyed by children. These hoops have a smaller diameter and they are ideal for twirling on your wrists, arms, or ankles. They are ideal for twirling multiple hoops at a time. Believe it or not, you can get a great upper-body workout twirling theses mini hoops. You can check out Troo Hoops.com for their mini hoops. Also, Hoopnotica recently came out with a workout DVD called Hoopnotica Minis Level 1. This DVD along with the mini hoops will sculpt and tone the arms, back, chest, and abs. Collapsible Hoops are designed for convenience and easy travel. I love these hoops because you can disconnect the tubings by pressing a button that unsnaps into pieces that can fit inside a hoop bag. You can then take bag anywhere with you. These hoops are the coolest thing!! And they are great for nighttime performance or play. Choosing the Right Hoop Size! To decide which size is best for you depends on your height and experience. If you are tall and/or first-time hooper, then you want to select a large hoop with a 42" diameter. These are full size adult hoops, which are perfect for beginners because they have a slower rotation and easy to start. You can get them either weighted or light weight. Medium size hoops with a 39" diameter are also great for beginners. If you consider yourself an intermediate hooper then a medium size would be perfect for you. Smaller size hoops with a 36" diameter have a faster rotation and can be used for a cardio workout. If you are purchasing a hula hoop for children then this would be the ideal size for them. Usually, advanced hoop dancers use smaller hoops for their performances. Where To Buy Hula Hoops! You can usually find sport hoops at just about any sporting good store like the Academy. 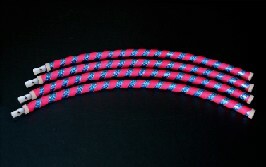 If you like to customize your hoop with various colors then you can check out Troo Hoops.com. They specialize in collapsible hoops with the easy snap button system. They also sell the LED hoops. And guess what? You are able to customize how you want your LED lights to appear. Pretty neat, Huh! Troo Hoops prices are not bad either. 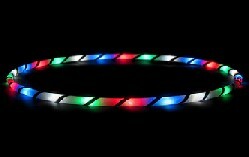 You can also check out my Amazon Store for LED Hoops.